The hottest thing in Chicago sports right now isn’t the Cubs, the Sox, the Bulls or the Blackhawks. It’s the Loyola Ramblers. The men’s basketball team is preparing for its Sweet 16 matchup on Thursday. The game comes after this weekend’s stunning last-second victory over number 3 seed Tennessee. The Ramblers, in the Sweet 16 for the first time since 1985, were back at it Monday for practice and film study of their upcoming opponent, Nevada. The team is once again calling itself the underdog. But as improbable as this run has been, the team is fairly confident heading into Thursday evening’s matchup, because Nevada is a 7 seed, and though they completed a stunning comeback themselves to defeat the higher-seeded Cincinatti Bearcats, Loyola has already downed some pretty major programs. Senior guard Ben Richardson offered up his scouting report Monday. By all accounts, the team has expertly handled the media spotlight that’s come with winning. Coach Porter Moser says he wants his players to savor and enjoy the moment and all that comes with it. But it has been an improbable, breathtaking run to this point, starting with the buzzer-beating game winner against Miami on Thursday, and then this last-second winning shot by Clayton Custer against Tennnessee on Saturday. Since then, it’s been nonstop media interviews and fan attention, something Moser says his players aren’t shying away from. On Sunday, the team arrived back from the tournament in Dallas to 400 fans waiting for them outside the Rogers Park campus. Students were walking around Monday sporting their maroon and gold. Moser talked about how this could galvanize interest in the university and the sports program for years to come. But first things first: The Ramblers take on Nevada in the Sweet 16 on Thursday night in Atlanta. 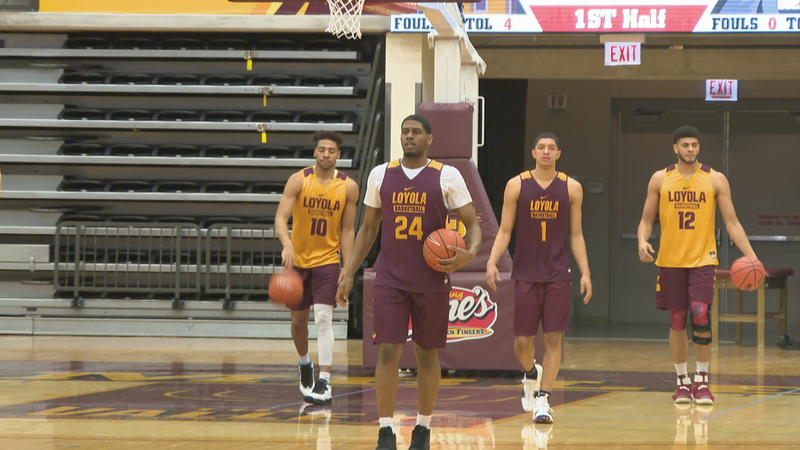 March 19: Loyola University Chicago scored it’s second straight heart-pounding victory Saturday, putting the Ramblers in the national spotlight once again. We remember the 1963 championship team. March 5: It’s been 33 years since Loyola University was in the NCAA Tournament. But they’re back, and dreaming of repeating the magic of the school’s 1963 national championship team.